First, another update on the moth guide. Many bookstores and retailers have already received and put out their copies of the guide, so the book is officially NOW AVAILABLE! I’ve also heard that Barnes & Noble has started shipping online orders; not sure about Amazon. I believe some retailers outside of the northeast won’t be selling the book till April 17, but presumably Barnes & Noble will still ship there now. One way or another, though, you should be able to get your hands on a copy quickly, if you want one! For those who have ordered a signed copy from me, I’m afraid I’m still operating on an April 17 release-date schedule – not anticipating bookstores to get or put out their copies early. I will be trying to get the books out as soon as I can, but please expect it to still be another couple of weeks. Sorry about that! I received this book the same day I got my first copy of the moth guide, about a month ago. At the time it was an advance copy, before the book was available in bookstores. It’s been released since then, so you should be able to find it now. I’ve been a follower of Julie’s blog for about five years now, having found it shortly before starting my own (hers was, in fact, one of the blogs that inspired mine). Not long after I discovered her blog, and without realizing I was already a fan of hers, my mom gave me a copy of her first book, Letters from Eden, for Christmas. I read that book in just a couple of days, immediately after Christmas. I’ve been looking forward to Julie’s new book pretty much since finishing that last one. It’s been a labour of love for her, the work spanning nearly as long as it took us to do the moth guide. But for all of Julie’s fans, it’s been worth the wait. The book was recently selected as Book of the Week on Oprah.com, and it’s easy to see why. 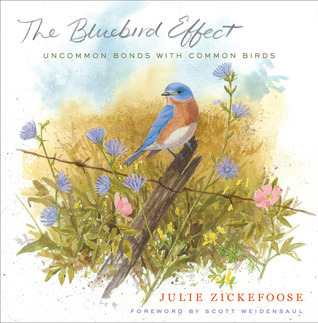 The Bluebird Effect is a collection of essays on the many different birds that have touched Julie’s life over her years as a birder and rehabilitator, starting with a male bluebird her husband saves from a local Sharp-shinned Hawk one day, and who thanks her by returning year after year to nest in the boxes in their yard. The title is drawn from the idea of the butterfly effect, applied to this bluebird; both in terms of the bluebird’s own effect on his local world through the young he raised, and his effect on Julie as she watched him and got to know him. The narrative is easy to read, picking you up and pulling you in with that same poetic quality that fills Julie’s blog. But of course, what makes the book so unique are the hundreds of watercolour paintings and pencil sketches that fill the pages, illustrating her stories. She’s got a distinct style to her artwork, managing to capture the essence of a bird in just a few quick strokes of the pencil or brush, a skill I’ve long admired. [O]pening the door into his life, if only for a little peek, brought home to me that almost everything in nature is so much more awe-inspiring than it first appears. … I thought about those who would question whether one middle-aged redtail was worth all the fossil fuel and frozen mice, man-hours, phone minutes, medical expertise, and X-ray film expended on his behalf. I’d argue that he was worth all that and more. Though it would not matter to him, in the Ohio countryside beneath his outstretched wings, he’d left a handful of human hearts, connected in joy. I was contacted by Michael Collins a while ago asking if I’d be interested in a copy of his book. Never one to turn down a free book (and this one had the promise of moths!) I said sure, I’d love to see it. It arrived not long after, and I had a quick flip through then set it on my shelf. I’ve been on a fiction binge lately and haven’t been in the mood for non-fiction (Julie’s book being the exception). Finally, earlier this week I finished up my most recently library novel and, not really being grabbed by any of the other titles waiting for me on my shelf, I decided to give this a go, since I’d promised Michael I’d review it. I’ll be completely honest: I was planning to read the first 40-50 pages or so, enough to get a feel for the book so I could post something here, and I could maybe come back to it at a later date. Well, I finished it in three days. Admittedly, it’s not a long book at just over 160 pages, and small pages at that. But that’s unfairly dismissive of the writing, which was very engaging. I had been expecting the book to be mostly about the capture and rearing of silkmoths, which was sort of how it had been described to me (not to mention what the title infers). 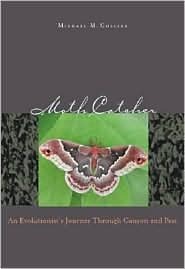 But it’s not really about that at all, though that’s sometimes touched on; it’s more about hybridization of species in nature, with moths playing the research subjects, and showing how the author’s early interests helped influence his choice of species and location for his work. The book falls into three sections. Chapters 1-3 are all a sort of personal chronicle of his boyhood (including a recipe for his neighbour and friend’s mint sauce), and then his experiences hiking the canyons and mountain passes of the book’s subtitle. This was definitely my favourite section of the book, taking me back to my three weeks spent on an ecology field course in the deserts of Arizona and California one year, and to my summer doing bird surveys in the Sierra Nevada mountains around Lake Tahoe. Even without this personal experience, though, the pictures Michael draws of these regions should bring you right there with him. In chapters 4-6 Michael starts to focus more on his graduate research looking at hybridization in the mountain passes where two closely related silkmoth species from either side of the mountains come together. These are also fascinating as he talks about collecting species and looking at the different mechanisms he discovered that maintain the two species as separate. And finally, in chapters 7-8 he discusses the science of hybridization in a broader sense, drawing on his own work and that of one of the inspirations for his graduate studies, Walter Sweadner. While still interesting, I did feel the book started to bog down a bit through these sections as the narrative gets more scientific and less personal, and found myself skimming the text in spots. Still, I found the book to be a light, easy read, and would definitely recommend it for anyone looking to learn more about silkmoths, the southwest, or species hybridization. Willing to wait! looking forward to the ephemeral moth enlightenment. perhaps, though, you could have released it on MOTHers’ day? Very exciting new book thankyou. Because the nation debt needs to rduceed or at least the deficit needs to be controlled The only way to do that is to increase taxes or cut spending. Where would you prefer him to begin cutting?